Manchester United manager Jose Mourinho will be putting all his eggs in one basket when he seeks against Celta Vigo at Old Trafford on Thursday to move a step closer to ensuring Champions League football for next season. The Portuguese coach has made no secret of the fact he has prioritised winning the Europa League over a top-four Premier League finish as the best route for United to secure a place in Europe’s elite club competition once again in 2017-18. 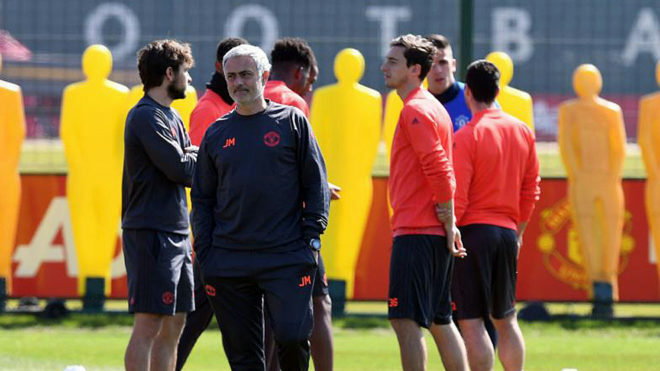 Mourinho takes his side into the Europa League semi-final second leg against Celta on Thursday, protecting a 1-0 lead comfortably earned in Spain and with United looking hot favourites to reach the final in Stockholm on May 24. He effectively gave up the challenge of earning Champions League qualification through United’s Premier League placing when he decided not to field his strongest team at Arsenal on Sunday and paid the price with an insipid 2-0 defeat. Mourinho’s caution earned him criticism from those United followers who believed he should have been more ambitious and gone all out for the victory at The Emirates which could have still given the team hope on two fronts. Most vociferous has been United’s former England midfielder Paul Ince who, in his column for bookmakers Paddy Power, described Mourinho’s approach as “rubbish” and “naive”. Yet Mourinho, who will bring back key figures like Paul Pogba, Marcus Rashford and Antonio Valencia against Celta Vigo after resting them from Sunday’s starting lineup, may have another good reason for focusing on the Europa League route. United are almost sure to go straight into the group stage of next season’s Champions League by winning the Europa League whereas they would have to go through the tricky final playoff round if they qualified by finishing fourth in the league. The rules dictate that if the winners of the Champions League don’t also qualify for next season’s competition via their home league placing, then the Europa League winners have to go through the playoffs. Yet with both Champions League finalists, Juventus and in all probability Real Madrid, sure to qualify through their domestic leagues, that will not apply. All of this depends on United finishing the job against Celta and then prevailing in a potentially tough final against, in all likelihood, a vibrant young Ajax Amsterdam side, who go to Olympique Lyonnais protecting a 4-1 lead in their semi. Yet Ince felt Mourinho had taken an unacceptable risk, with United now four points behind local rivals Manchester City with three Premier League games remaining. “Jose Mourinho keeps going on about playing a ‘weakened’ team against Arsenal to save themselves for the Europa League second leg. It’s rubbish,” Ince said. “They’ve got some really unfortunate injuries but they still have an excellent squad and should be able to cope with playing both games. “I can see they’re clearly going for the Europa League as the main target, but I think that’s naive.